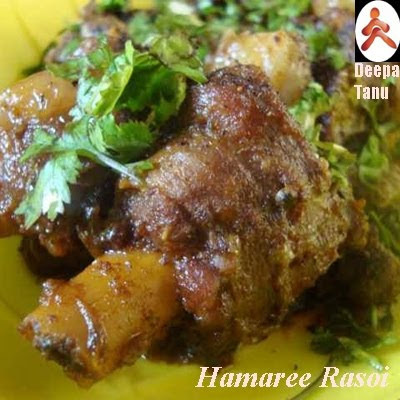 Mutton Do Piaza is a rich and delicious Mughlai recipe. As mughlai cooking emphasizes on good ingredients, rich spices on low flame.Such a dish was considered to be a great delicacy in medieval times. Mutton Do piaza means " application of onions in two different forms" once at the start of the cooking in ground form and later sliced and fried. Though Mughals are no more but their culinary delicacies still fascinates us. 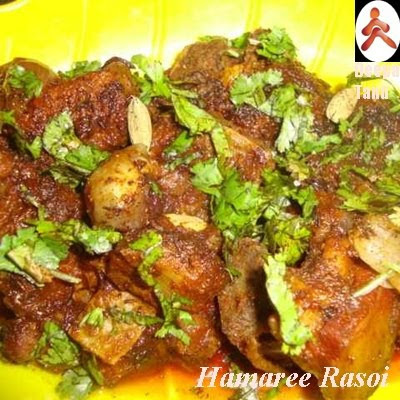 This dish has a distinctive aroma and the taste of whole spices and crunchy onions is awesome!!! Marinate mutton with salt and turmeric for 1/2 hour. Heat ghee/oil in a pressure cooker, fry onion rings till they turn brown in colour. Remove fried onions from oil. Keep aside. Reheat the remaining oil, add bay leaf, pepper corn, fenugreek seeds, ginger-garlic paste. Stir for a minute, add red chilli powder and immediately add the ground onion paste. Mix well. Add the yogurt, stir frying vigorously so that it blends well and doesn't curdle. Cook till oil separates. Add mutton now. Keep stirring so that it doesn't stick to the bottom. Add fried onions (which was kept aside), green chillies and button onions. continue cooking over medium heat, till the oil separates. Pour 1/2 cup hot water and salt in it. Pressure cook to give 1 whistle. Serve hot, garnish with crushed green cardamom, garam masala, cumin seeds and chopped coriander leaves. Relish this mutton do piaza with hot chapatis or even with plain paratha, and I bet you will experience sheer bliss in your taste buds!!!!! 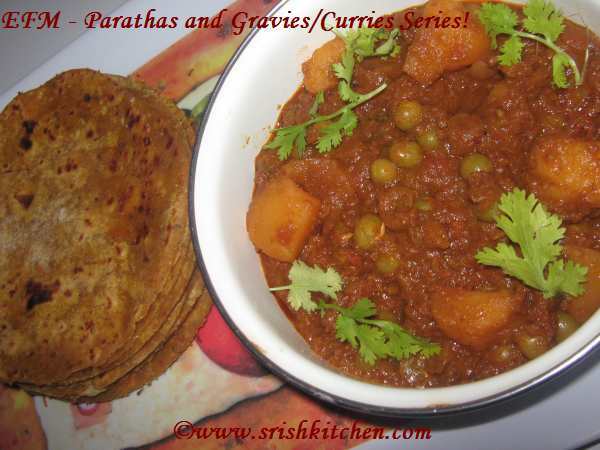 This post goes to Shrilekha's "EFM Theme - Parathas and Gravies event. Very gorgeous looking mutton dish. That mutton looks moist and ready to fall off the bone in the second shot. Looks mouthwatering for sure! i love mughalai dishes.. this one looks so yummy and delicious! Lovely and colourful dish Deepa!! @ Ash kuku: You mean to say that you were a veggi before u got married? I love your slow cooked mutton and gravy....it has so much gusto and your pictures are just heavenly to boot!This will make any hungry soul happy! ami meat khaina tabe bar khub bhalobase. banabo eta or jonye akdin. or bhshon fav. between thats an incredible spread on your header. Oh that looks so yummy! I love onions. I don't get to eat a lot of it bc my husband abhors onions... It's really sad. wow!!! that looks so mouthwatering ! !1yummy yumm!!! Looks smashing....tried today....and came out as a delicious dish... Thanx for the reciepe.